-So the Enterprise gets out to this sacred Vulcan monastery--P'Jem--and find its caretaker acting all fishy and weird (you know, for a Vulcan). They soon discover that the place is overrun by Andorians who believe P'Jem is being used as a spying station. -This one is a great exploration of the "Vulcans Are Jerks" trope in Enterprise. I really like this stuff. I know a lot of people scoff at how pissy the Vulcans seem in these early years but, I have to say, after eleven months of them, I can totally see this as a realistic choice. Spock (though I love him) is a xenophobic jerk, always making jabs at humanity (even though his mom is totally human) in TOS and even in TNG, where humanity's relationship with this species is about as good as it could be, there are quite a few snobby Vulcans always ready to snip and quip about silly humans. 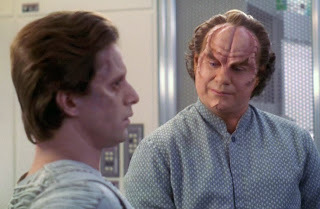 -Bonus points for Jeffrey Combs' return to Trek as Shran. This is my favorite Combs Character so I was legit thrilled to see him again. -This episode's story is told in the form of a letter to Phlox's human pen pal. The Enterprise is begged for help by a culture suffering from a deadly plague. But, when they try to help, they realize things are more complicated than they'd anticipated. -Due to Phlox/Archer's decision about whether to help the culture, this episode is pretty controversial. And, even though I lean toward disagreement with them, I love Dear Doctor. -This is a completely character-driven episode. Phlox needed to be fleshed out and this started his journey toward being a more real, more interesting person. He's not Quark. 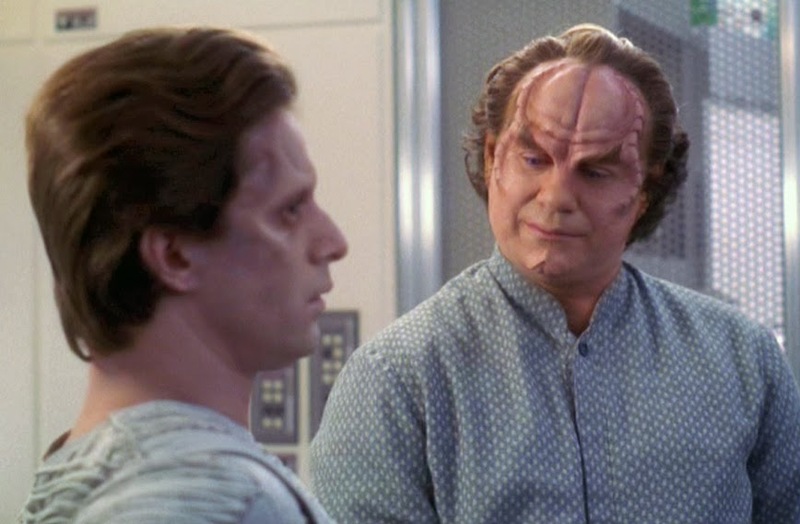 He's not Neelix. He's his own person and he's tough, smart, and (beneath that jolly exterior) kind of lonely. -The Prime Directive. Oh man, these guys are really flying by the seat of their pants. Scott and I often refer to this episode whenever we talk about Enterprise because it's the first time we get a conversation about how they need established guidelines when it comes to interference with alien species. -Ok, a bunch of touchy feely Vulcans show up to help round out the kinds of Vulcans we see in Enterprise. One of them is a total jerk and subjects T'Pol to a really uncomfortable mindmeld. -Again, I like this one because it's a character-driven episode and T'Pol is starting to get a little meat on her character's skeleton. We begin to understand more about her past and her decision to stick around on Enterprise. -Much like Dear Doctor, this one features a chronological first--the mind meld. Man, Spock mind melded with basically everybody he met. By the time we get to TOS, it's pretty much the Vulcan equivalent of a hug (where, I guess, the Vulcan salute is the equivalent of a handshake?) but here in the 2150's it's not even a little bit ok. It's considered invasive and dangerous and people don't really know how to do it. Alright, I'm really Enterprise right now and I've got a lot of ideas about posts (including a Captain's Vlog!) so hopefully I can get back on track tomorrow!